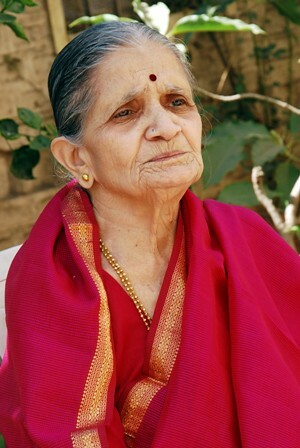 Serene Courage is how I remember this great granny from Nashik. At 85, her skin is as radiant as that of a young girl. Her serene gaze misses nothing and her warm demeanour draws people to her instantly. It is later in the conversation that one also realizes the will power and clarity of thought with which she has lived her life. Mother of three daughters and one son, grandmother of seven, and great-grandmother of eight, Smt. Sushila Kulkarni is a unique mix of gentleness and determination. Marrying a person of her own choice against many odds, embracing his family as her own in the face of indifference, and not compromising on her inner sense of duty as well as right. I was mesmerized listening to this beautiful great-grandmother during my recent visit to Nashik in Maharashtra. She replied to my endless questions fluently in both English and Hindi. The icing on the cake was the affection and admiration in the eyes of her daughter-in-law, Kanchan. Both of them shared that easy rapport that comes from years of living together in harmonious co-existence as a joint family. Namaste. Tell me about your childhood. I was born in September 1929 in a village called Kashil which is near Satara on the Pune-Bangalore highway. My maternal family belonged to the sect of Kokanastha Brahmins. I grew up with three sisters and one brother. My father was a forest ranger during the British rule. We had lots of land in Kashil where I remember the mango trees and acres of wheat, jowar and groundnuts. I studied up to the tenth standard after which I worked in the fields. I used to supervise the farmers and keep an eye on them to minimize cheating of any sort. You seem to have enjoyed the village life. Yes, I remember how all of us drew water from the well, helped in housework and walked to the river side for our bath. Our village was at the confluence of the rivers Krishna and Urmodi. We easily walked a couple of miles everyday to reach the river side. Did you complete your studies in Kashil? Yes, in the village school where Marathi was the main language. My father passed away when I was just two years old. My mother was quite strict and taught us the importance of discipline. She sent me to Satara district to stay with my sister when I was in my 4th standard. This is where I learnt to speak English. I stayed there for two years, came back to Kashil for a couple of years, and then went on to stay with my second sister in Pune for three years. I also stayed with my eldest sister in Mumbai for a year. Thus I did my schooling in different places. And then you married a man of your choice? Was it acceptable in those days? Not at all! Both the families were against it. If we had not been determined, it may not have happened. We had a large house and we had rented a portion of it to Mr. Laxman Mahadeo Kulkarni who was the headmaster of the village school. He stayed there with his family. His son, Gajanan, and I took a liking to each other and decided to get married. My mother did not approve of it because they were Deshasta Brahmins and also not as well to do as my own family. I appealed to my brother but he did not relent. My mother refused to attend the wedding but my eldest sister stood by my side and helped us get married in Bombay in the year 1951. I can imagine the courage it must have taken. Looking at you, I will call it a serene courage. Did you live with his family? Initially we both stayed in Mumbai for six years. After that, my husband moved to Koyna Nagar for the dam project. Around that time, my father-in-law started working in Satara for the government for evacuating property. He fell quite unwell, so both of us moved to Satara. That was a new phase in my life. Theirs was a large joint family and because of my father-in-law’s failing health, they were facing a difficult time financially. My husband was the eldest, so we had many responsibilities. But we decided to manage come what may. We stayed there for seven years. When my father-in-law expired in 1968, we moved to Bhor. What was the mantra that kept you going through this period? More than anything, my husband and I believed that education was important and would help the younger siblings to construct their lives. I think that won me much appreciation in the long run. Kanchan (daughter-in-law): She has always been very patient and caring. The family now speaks much about her sacrifice and adjustments and believe that it has made the family bond stronger. Sushilaji, you must share with us your views on changing times and family values! I think one good thing earlier was that we could make do with less money. Now we have more wealth but the value has fallen. Youngsters are not able to make the adjustments we could make for harmonious living. But what I do appreciate now is that everyone is learning to value education, and that really adds to the quality of life. And how do you keep yourself occupied? I follow a simple routine of helping with breakfast in the mornings. After that, I bathe and get busy with my prayers. I read the scriptures and enjoy writing some religious examinations. Apart from this, I have always done some amount of social work. I have been actively involved in the Rashtra Sevika Samiti (RSS) for decades. I am now a life member and stay active in the Rani Lakshmi Smarak Samiti. I am a member of their governing council. I help with the activities and accounts of their trust, and help in raising funds. During festivals like Diwali, I stay back and supervise the making of sweets and savouries in their premises. Kanchan (daughter-in-law): She has always been very focussed and determined. What I really admire is her healthy lifestyle and that she is unafraid to follow what she believes in. I am intrigued by the bond and simple affection you both share! Kanchan (daughter-in-law): She is quite straightforward, so that makes things easy. She never talks ill of anyone, never gets angry and practices what she advises. What one must learn from her is control over speech. She has been a positive influence over her children, and now over the next generations. Sushilaji: (laughs) I also shared a lovely relationship with my mother-in-law. My father-in-law was quite strict, but she was very adjusting. Kanchan: And it is easy to take care of her because she takes good care of her own health. If ever she is unwell, she tells us not to worry and never to take her to the hospital. And of course, most importantly, I love her cooking. We all do. Sushilaji, what are your special delicacies? I am a pure vegetarian and have always enjoyed cooking. The children love my sweets such as puran poli (sweet rotis) and aalyachi wadi (ginger burfi). Let me share one of these recipes with you. First published in June 2014 in Harmony – the Indian magazine for silvers for the column – The Great Granny Diaries. Part-2 of this post is Ginger burfi from the kitchen of Sushila Gajanan Kulkarni. She is the 21st grandmother featured in this column.